On August 7, 2012, Harriet Prettyman gave me a few of her older family photos, including the photo pictured below. The woman in the lower right of the photo is my great-great grandmother, Hattie Eddy Askew. Hattie Eddy Askew lived a short life, dying in her early thirties (32-34) at the young age of 33. She died around 1908-1910† on February 14, 1909, at her farm home outside Casselton, North Dakota. She died of pneumonia, which I was told she caught on a trip to Colorado as a result of a sudden and unexpected heart failure following an illness of about a week’s duration. Not only did her grandchildren never get a chance to meet her, but her own children were only about 1, 8, and 10 1 ¾, nearly 9, and 12 ¾ years old when she died, so they also didn’t get much of a chance to learn about their mother as a person. This is only the second definitive photo I’ve found of Hattie Eddy Askew, which is why I’m interested in learning as much as I can about this photo. What follows is a log I kept of my initial research on this photo. 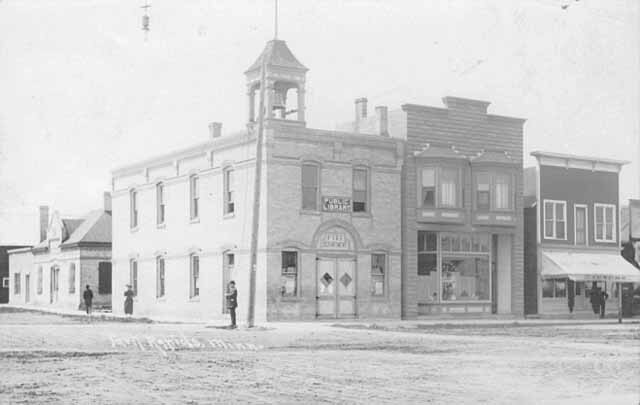 According to the Minnesota Historical Society’s Directory of Minnesota Photographers, the Smith and Wilkins photo studio in Park Rapids, Minnesota, was in business only from 1904 to 1906. As a studio photograph, it would almost certainly have been taken at their studio in Park Rapids, in Hubbard County. 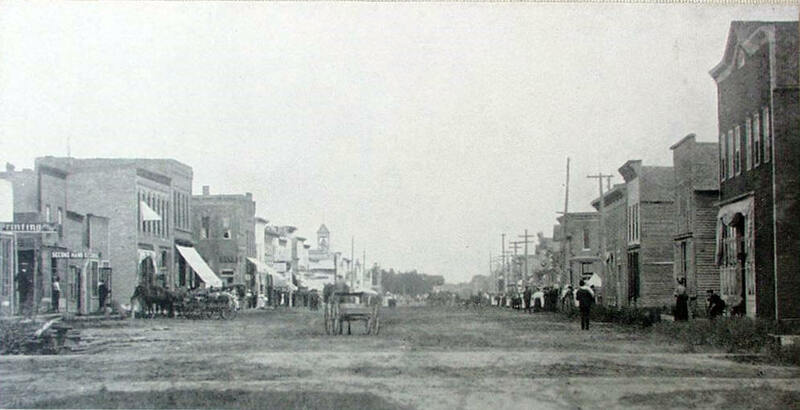 Park Rapids was about 12 miles north of Menahga along what is now U.S. Route 71. Park Rapids wasn’t a big city, but it was about twice as large and twice as populated as Menahga. It had a population of 1,313 in 1900 and 1,801 in 1910. 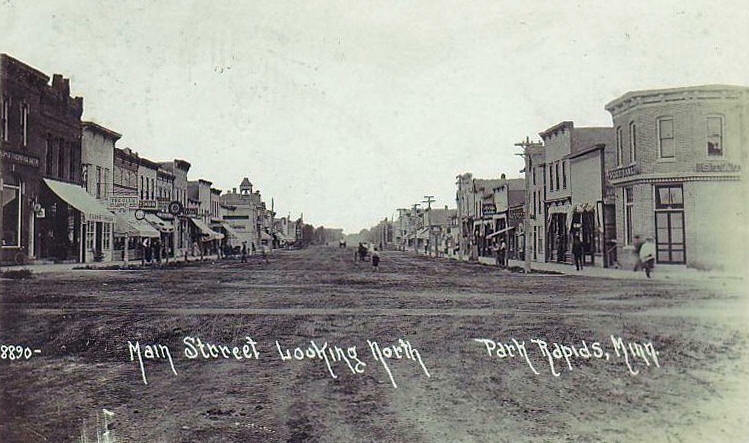 To give you an idea of what Park Rapids looked like at about the time the women had their picture taken, below is a view of Main Street in Park Rapids taken around 1910 (top), a street scene taken around 1909 (middle), and a view of Main Street looking north around 1913 (bottom). On the 1900 U.S. census for Menahga village, Minnesota (see image below), Samuel C. Askew (Hattie’s brother-in-law) and his family were enumerated in dwelling 11. His two next-door neighbors were his parents (Jane and Joseph Askew, dwelling 10) and the Young family (dwelling 12). In 1900, Vennie Jane Young was 15 years old and was living at home with her parents and brother. At the time of this photo, Vennie would have been 19-21 years old. Vennie’s father was W. W. Young, an older, Canadian-born man with a English-born wife who was 16 years his junior (they married when he was 35 and she was 19). W.W. and Elizabeth A. Young had two children, Vennie J. (15) and Wilfried R. (9). Despite the fact that Menahga was a small town (just over 650 people in 1900, mostly children) where most men were either farmers or day laborers, Vennie’s father’s occupation was listed as “Merry Go around” proprietor! Vennie married Charles L. Bradt around 1903, when she was 19 years old. The couple was living in Wadena, MN, in 1900, but later moved to Park Rapids. In 1920, Charles was the Deputy Register of Deeds for Hubbard County, and in 1930 he was the Clerk of Court for Hubbard County. The couple lived out their lives in Park Rapids, and are both buried there, in Greenwood Cemetery. 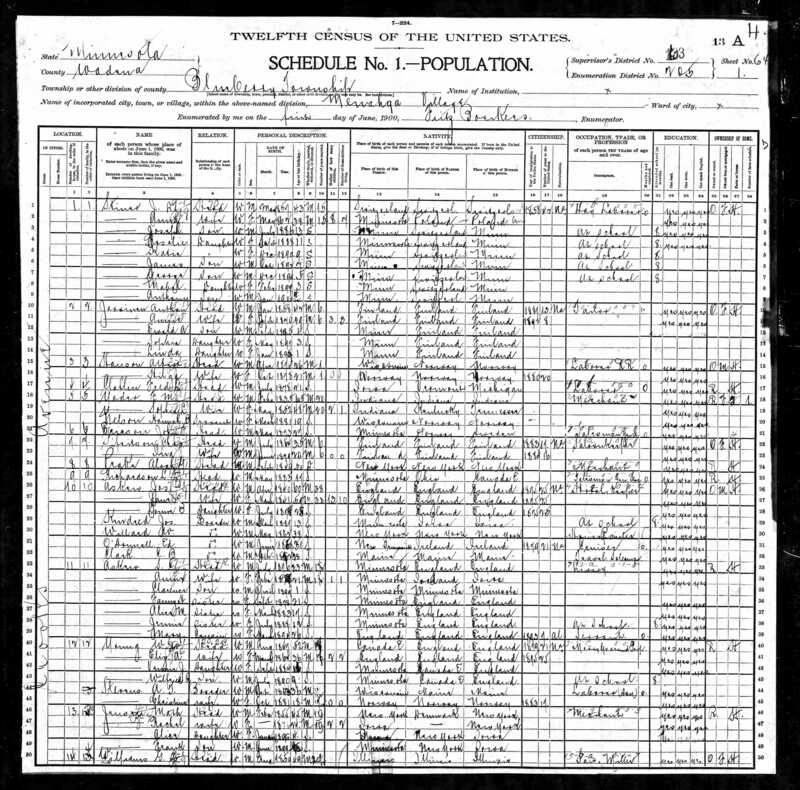 Mary A. Askew appears to have been a cousin of Samuel C. Askew who immigrated to the U.S. in 1893 and was living with Samuel and his family at the time of the 1900 census (see image above). A few years later, she married Irvine E. Officer (according to the 1930 census, Mary was 30 years old when she was first married; since she was 55 at the time of the 1930 census, she would have been married around 1905). The only McDermott in my family tree is Anna C. McDermott, Samuel Clarence Askew’s wife. Perhaps Kate is Anna’s sister, or cousin? I could find no McDermotts or Pauls on the 1900 census for Menahga village, MN. How did these women know each other? The captions were written after Mary’s marriage in ca. 1905, but they were probably written well after the photo’s creation. A clue to the identity of the annotator is that Kate McDermott Paul is referred to as “aunt Kate McDermott Paul.” Until I can determine who Kate McDermott Paul is, however, I won’t be able to go much further into uncovering the annotator. † The exact date of Hattie’s death is currently uncertain (ca. 1908–1910). Harriet (Askew) Prettyman once told me that Hattie died around 1908, but I also discovered a note written by Harriet’s now-deceased aunt, Eva Scott Martes—the sister-in-law of Hattie’s eldest child, Clyde—stating that Hattie died in 1911. However, as Hattie’s children were already living in Dieringer, Pierce County, Washington, with their aunt and uncle, Martha Alice “Mattie” (Eddy) Stewart and Addison Stewart at the time of the 1910 census (enumerated on May 4-6, 1910), Hattie had most likely already died by May, 1910. This entry was posted in 1890s, 1900s, Hattie Eddy and tagged Minnesota by Michael. Bookmark the permalink.